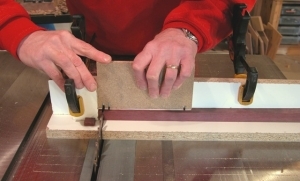 Homemade miter gauge sled and hold down intended to facilitate the safe handling of small parts on a table saw. Hold down was constructed from particle board and self-stick foam. Sled was fashioned from 3/4" melamine board.